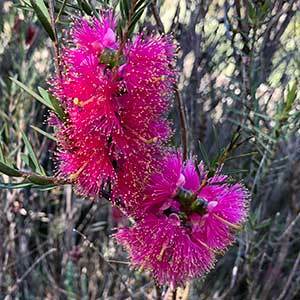 The species is commonly called the Scarlet Honey myrtle, however the flower colour of Melaleuca fulgens does vary. From red to orange and purple, this is a native plant that is well suited to the home garden. The flowers are typical bottlebrush shaped, the foliage is a mid green fine and linear. You can prune it shape however light pruning is best. This is a plant with an open growth habit, it could be used as a feature plant where the flowers take pride off place, to planted in a row as an informal screen. It is reasonably drought tolerant, grows well in coastal soils and is also long flowering, as an added bonus it attracts bees and birds to the garden. Melaleuca fulgens Apricot Delight has orange to apricot coloured flower. Melaleuca fulgens Hot Pink has bright pink flowers – pictured right. Origins – Western Australia, NT and South Australia.